Visit Ryde on the Isle of Wight for some artisan goodness! For a three month duration from May 2018 to August 2018, the wire-work designs by Earth Balance Craft were on display at The People’s Gallery on the High Street in Ryde, on the Isle of Wight. Designer Nicola’s collection of hand-made sun catchers, hanging ornaments, decorations and wall art were exhibited alongside an array of local independent artists, artisan craftsman and designers. 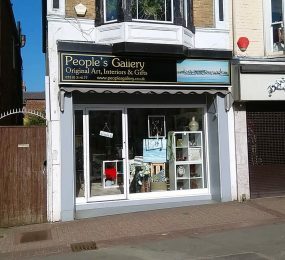 About: The People’s Gallery is a place where new and established independent Isle of Wight artists can display their work in professional gallery on the main High Street in Ryde. Address: 28 High Street, Ryde, Isle of Wight, PO33 2HT. Opening Times: Open Monday to Saturday 10 am until 4 pm except Thursdays 10 am to 1 pm.